When it comes to movie stars and USC alumni, it doesn’t get much bigger than John Wayne. More hero than man, the American legend captured the interest of moviegoers in more than 140 films, forever earning himself a place in cinematic history. 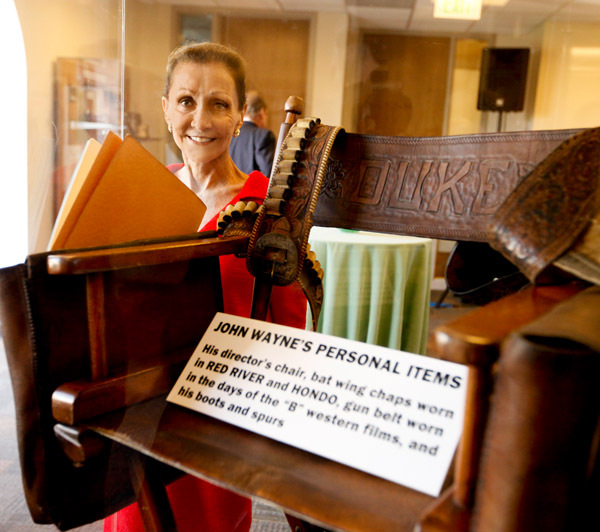 On June 20th, the USC School of Cinematic Arts dedicated the Wayne Collection which was curated by John Wayne’s late son Michael, and donated by Michael’s widow Gretchen Wayne. The collection, comprised of movie posters, memorabilia, awards and personal correspondence, is on permanent exhibition within the SCA complex. Collection. Photo credit: Steve Cohn. Guests included Gretchen Wayne’s children Josie, Christopher, Teresa, Alicia and husband Jim McFarlane, Maria and husband Lance King, grandchildren Patrick and Kathryn McFarland, as well as Iron Mountain’s Jeff Anthony, Guy Abrahams and Amy Helbring who help maintain the John Wayne archives.